Vegetables and fruits provide fiber, vitamins, minerals, antioxidants, and other plant compounds that have been found to have cancer-protective effects. Not only are vegetables and fruits helpful for cancer prevention, they are also important components for the prevention of other chronic diseases. In a small saucepan, make a balsamic vinegar reduction by bringing 1/3 cup balsamic vinegar to a simmer over medium heat. Once the balsamic vinegar starts to simmer, lower the heat to medium-low, and simmer for six to ten minutes. In a large shallow bowl, combine 1 cup hulled and sliced strawberries, 1 cup halved grape tomatoes, 1 medium-ripe, pitted, and diced avocado, and 1/3 cup loosely packed cut basil leaves. Drizzle on 1½ teaspoons extra-virgin oil, and gently toss until the vegetables and fruits are coated. Season with salt and pepper to taste, and toss again briefly. Top your salad with the desired amount of toasted sesame seeds or pecans. Drizzle on the balsamic vinegar reduction. This salad is best enjoyed fresh, but leftovers can be stored in an airtight container for a few hours if necessary. Combine 2 cups diced cucumber, ½ cup crumbled feta cheese, 1 cup cooked or canned low-sodium or sodium-free garbanzo beans (chickpeas), ½ cup thinly sliced red onion, ¼ cup chopped Kalamata olives, and 2 tablespoons chopped fresh parsley. Mix the juice of 1 lemon with ¼ cup extra-virgin olive oil, then pour onto salad. Stir gently. Sprinkle with pepper to taste. Chill for two hours before serving. 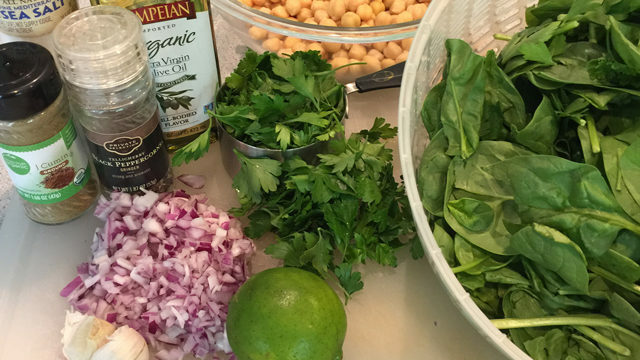 or canned low-sodium or sodium-free chickpeas and ¾ cup chopped red onion, and stir. In a small bowl, mix ¼ cup lime juice, 2 tablespoons extra-virgin olive oil, 2 cloves minced garlic, 1 teaspoon ground cumin, and salt and pepper to taste. Pour this mixture over the spinach-chickpea mixture and stir gently, but well. This is best left to stand for 10 minutes, or overnight in the refrigerator, to let the flavors develop. This recipe can be eaten several ways. Place it on top of a bed of salad greens or next to sliced tomatoes. Or spoon this salad into a whole-grain pita pocket. It’s yummy alone or with your favorite hummus. celery stalks, and 1 small, thinly sliced red-skinned or gold potato. Partially cover, and leave it simmering gently for about 40 more minutes. Stir occasionally. If needed, add more water. Add black pepper and 3 to 4 tablespoons red wine vinegar (if desired) to taste. Serve topped with a diced tomato and/or minced parsley. of the seed mixture in a small bowl. Transfer the rest of the seeds to a large bowl. In the large bowl, add 2 cups white whole-wheat flour, 1 tablespoon baking powder, ½ teaspoon baking soda, and ½ teaspoon salt, and mix to combine. Whisk 3 large eggs in a medium-sized bowl, then add 1½ cups buttermilk, 1 cup rolled oats, ½ cup extra-virgin olive oil, and 2 tablespoons maple syrup or honey. Pour the wet ingredients into the bowl with the dry ingredients; stir and fold together until combined. Scrape the batter with a spatula into the prepared loaf pan. Sprinkle with the reserved seeds. Bake until golden brown and a toothpick inserted into the center of the loaf comes out clean – about 45 to 55 minutes. Let cool in the pan for about 30 minutes before turning out onto a wire rack to cool completely. Preheat oven to 400 degrees. Toss 2 pounds sweet potatoes, peeled and diced into ¾-inch cubes, with 2 teaspoons real maple syrup and 1 teaspoon olive oil; season with ¼ teaspoon salt and ½ teaspoon black pepper. Roast sweet potatoes for 20 to 25 minutes until just cooked through; once removed, reduce oven heat to 350 degrees. To prepare the maple ginger vinaigrette dressing, place a whole pear (without core or stem) on a sheet pan and roast for 25 to 30 minutes at 350 degrees until softened and slightly caramelized. Place the pear in a blender or food processor with ¼ cup minced shallot, 1 teaspoon minced fresh garlic, 1 teaspoon minced fresh ginger, ½ cup apple cider vinegar, ¼ cup pure maple syrup, 1 teaspoon Dijon mustard, ½ cup unsweetened apple juice, and ½ teaspoon black pepper and purée until smooth. Combine 18 ounces (6 and ¾ cups) spring mix lettuce, 3 cups cooked wild rice, cooked sweet potatoes, 2 tablespoons green onions, and 2 tablespoons dried unsweetened cherries with the dressing, and toss. Place the mixture in a bowl and garnish with chopped walnuts. an immersion blender, purée the soup. Ladle into soup bowls and serve hot. Garnish with chopped fresh chives or baked ginger (if using). If you don’t have an immersion blender, you can allow the soup to cool off and purée (in batches, if needed) in a regular blender. To make baked ginger: Brush ginger with olive oil and bake at 400 degrees until crisp. 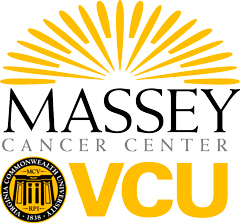 Elizabeth Miller, RD, CSO, is a nutritionist at VCU Massey Cancer Center.